Affirmative action is one of the best examples to demonstrate the hypocrisy of racial civil rights. Black Americans have been demanding to be treated as equals with white Americans. Yes, many black Americans have been discriminated against for years and yes, I believe they deserve equal treatment. After all, we are all the SAME race, the human race. Some of us have more skin pigment than others, but we are all humans. However, just because they have been discriminated against for years due to their darker skin color, doesn’t mean black Americans deserve special or preferential treatment. Yet that’s exactly what so many black activists demand and affirmative action is just that, preferential treatment above and beyond what any group deserves. 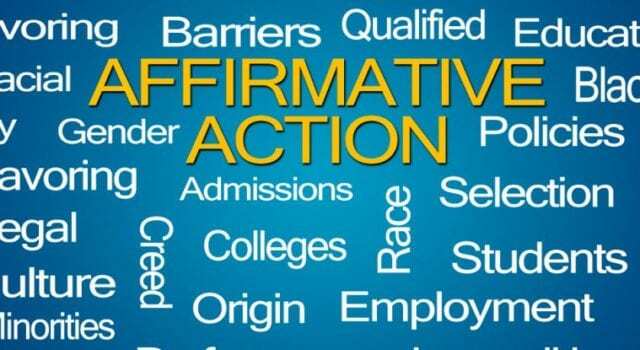 Affirmative action is a program used by many colleges, universities and even employers that gives black American’s and other minority groups preferential consideration over white male Americans. I know an employer who had to hire and train workers according to affirmative action guidelines. Most of the jobs were outdoor manual labor and heavy equipment operation. The employer was instructed that they had to hire at least 20% minorities – blacks, Hispanic, American Indian or female. When jobs for operating certain pieces of heavy equipment came open, the employer was forced to bypass fully qualified white males and try to find minority applicants. In one case, they hired one minority (female, black, Hispanic, etc.) after another and tried to train them to properly operate the piece of heavy equipment. This went on and on for over two years, but none of the minority applicants were able to learn the necessary skills. The employer ended up paying for over two years of pay to unqualified and inept workers, before they were finally given permission to hire one of their own white males who was fully qualified to operate the equipment. In colleges and universities that use affirmative action as part of the admission policies, certain applicants, especially black applicants are given preferential status. They are automatically given extra points towards admission just because of their skin color. Affirmative action has been used to admit lesser qualified minorities into medical schools over better qualified white males. Many have advocated that affirmative action is a form of reverse discrimination. US Attorney General Jeff Sessions has directed the Justice Department’s Civil Rights Division to begin investigating colleges and universities who have been using affirmative action to discriminate against white applicants. What has many liberals and activists alarmed and worried is that the investigation into illegal affirmative action policies is not being conducted by the department, Education Opportunities Section, that normally handles this type of thing. Instead, the investigation is being run out of the civil rights division’s front office. The difference is what alarms liberals and activists. The Education Opportunities Section is run by career individuals whereas the front office is run by individuals who have been appointed by the Trump administration. That means the investigation will be run by conservatives instead of a hodge-podge of conservatives and liberals. Liberals are claiming the investigation will use ‘intentional race-based discrimination’, meaning they will be intentionally looking for reasons to stop affirmative action. Previous articleGore the Carbon whore?